That's the mantra of the modern digital marketer, right? Well it turns out that there's a limit to how much value you'll receive from testing something into the ground. In a world of scarce resources and limited time, I want to share a perspective on choosing what to test and how far to take it. Landing page conversion rates are one of the most popular components to test in a digital marketing mix. There are dozens of tools dedicated to landing page A/B and multi-variate tests. Without a doubt, increasing your landing page conversion rate can provide major lift to your campaign, particularly when it comes to lowering the cost per acquisition in your paid traffic campaigns. But are all landing page gains created equally? Let's imagine that each round of testing and optimizations move our landing page conversion rate up in increments of 5%. You can see that with the first improvement, a 20% to a 25% page conversion rate, the CPA (cost per acquisition) drops from $2.50 to $2.00 - a 20% reduction in cost, hoorah! At scale (higher daily spend amounts), this has a monumental impact on the profitability of the campaign. But look at the next increase: a boost from 25%-30% yields a 16% decrease in CPA. As you look down that % change column, a pattern emerges: as conversion rate improves at fixed increments, the relative improvements to CPA get worse and worse. Look at the graph above. See how steep the red curve (CPA) is in the beginning? That represents the immediate and dramatic gains the campaign will see with first round of improvements to the landing page conversion rate. 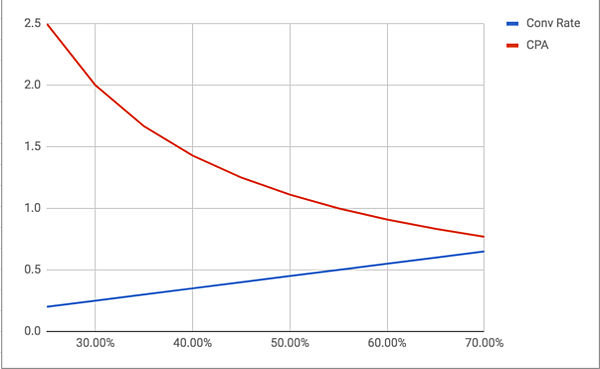 But as the conversion rate improvements continue, the red curve flattens out. The bump from 20% to 25% brings CPA down from $2.50 to $2.00 while the bump from 65% to 70% takes CPA from $0.77 to $0.71. What we've stumbled upon here looks similar to a classic economic principle called, The Law of Diminishing Marginal Returns. If you study for 10 hours straight, the gains you'll see from hours 9 and 10 when you're exhausted are vastly different from hours 1 and 2 when you're fresh. So if the majority of value in landing page testing comes from the initial gains, how should this impact our focus? Find the low-hanging fruit, the main blockers to a point of conversion. Most initial gains can be achieved by improving things like UX. Use a tool like Hotjar to spot where your users are running into roadblocks, like a funky rendering of the page on their particular mobile device. Start pulling other levers within your campaign and funnel to improve overall performance. 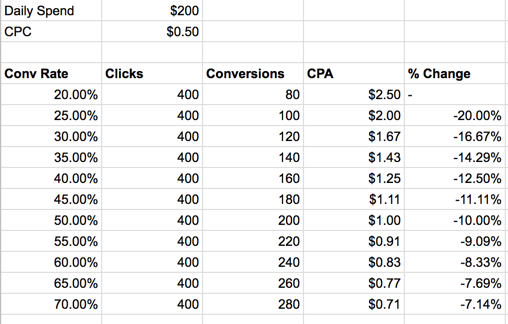 If you're running paid traffic from Facebook or Adwords, how is your CTR (click-through-rate)? Have you introduced retargeting at the back-end of your campaign to capture bounced visitors later? The greatest gains come from optimizing multiple parts of your funnel towards a singular goal. Apply this same principle of diminishing returns to other components of your marketing. Don't get fixated on what's easy or fun to test. 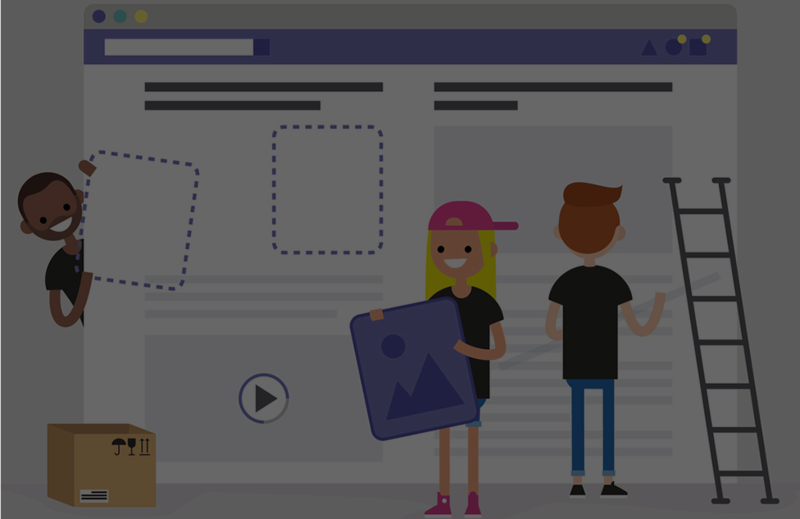 After you get early gains for CTR, don't keep cycling in new ad images for the Facebook newsfeed, start testing new audiences or pull some other lever in your campaign. ← Is Facebook about to share your ad strategy with competitors?